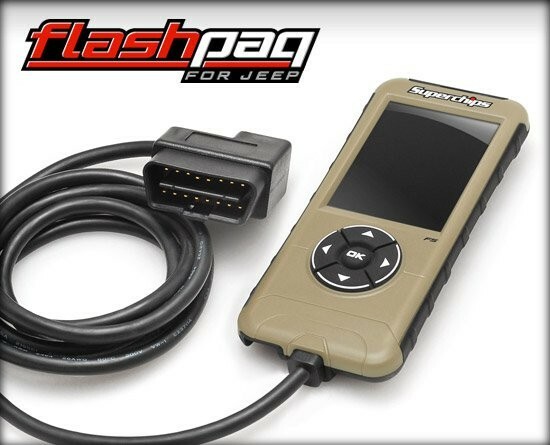 The Flashpaq for Jeep is the industry-leading performance programmer for Jeep Wrangler TJ and JK models. 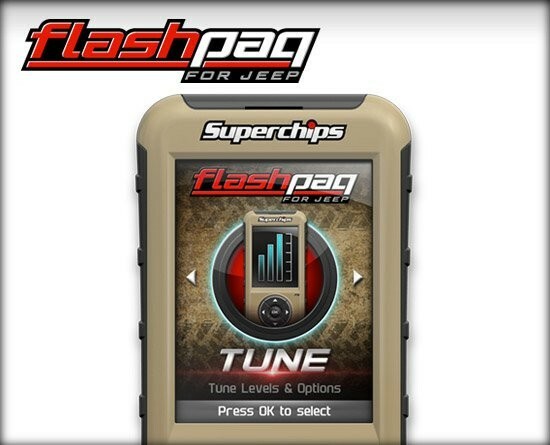 With performance tunes and features engineered for added power and functionality, the Jeep Flashpaq has become the "people's champ" when it comes to a performance upgrade for any TJ and JK Wrangler. 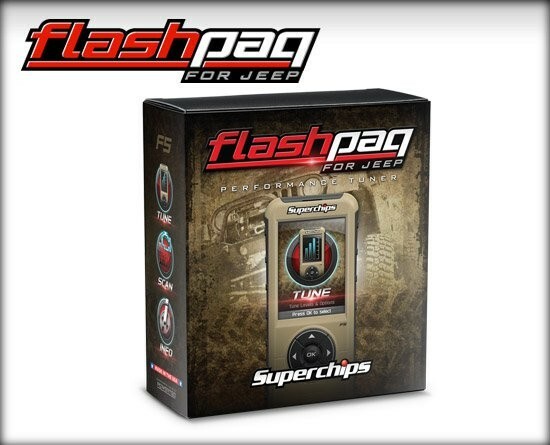 Equipped with a 2 year powertrain warranty, the Jeep Flashpaq is safe to install, delivers instant improvements, and offers tires, gear, and TPMS options. Note, this SKU covers Jeeps from 1998-2014. For 2015-UP coverage, please PN 3876. * Results and feature set may vary based on vehicle make, model, and aftermarket upgrades. Read all instructions before installation and/or operation of this product use. 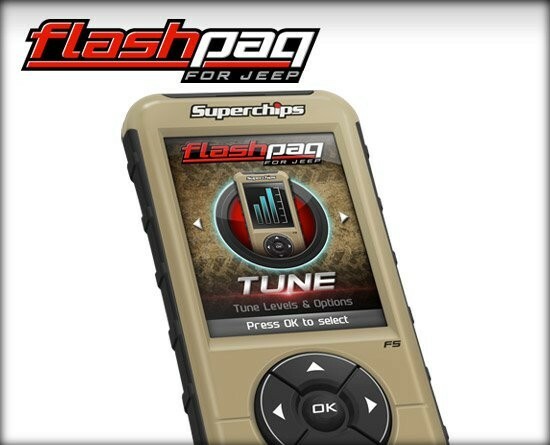 ** This product has not been tested or validated on right hand drive Jeep applications or imported (non-American VIN based)Jeep applications. They are not supported by this product. 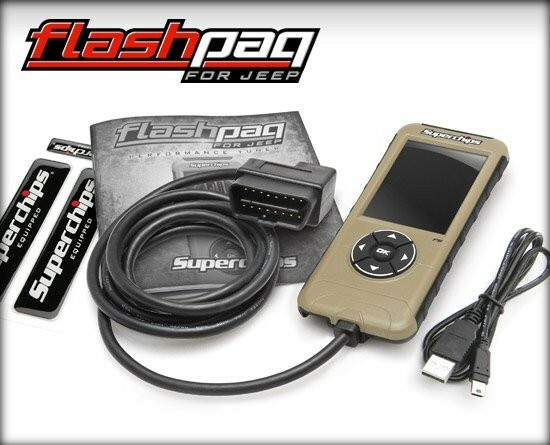 F5 Flashpaq for Jeep® is rated 4.5 out of 5 by 73. Rated 5 out of 5 by billrossi85 from Wow I waited anxiously for 9 days for this baby to arrive. As soon as the UPS dropped it off I updated it and plugged it in. My 2007 JK no longer feels like a minivan. Throttle response is greatly improved, definitely feel more power. My speedometer finally reads correctly as well. I have only tried the 93 octane tune so far and havent put enough miles on it to check the MPG, but so far so good. My JK sat for over two years when I spun a rod bearing and didn't have the funds to replace the motor at the time. I got it back on the road about 2 months ago and until yesterday it was really underpowered. Thanks Superchips! Eventually I think I will be upgrading to the Traildash. Rated 5 out of 5 by Terpsmandan from Wakes it up I got this because the 3.8 is so anemic and I really realized it when we got my wife a 2015 with the 3.6. I did not want to do an exhaust or a CAI and decided to give this a try. So I did a quick test of a street start from 1500 to 5000 rpm and the 87 tune was almost half a second faster than stock. I am now running the 93 tune and I can feel that it is faster above 3000 rpm when I am passing someone. It seems to take about a week of driving for the Jeep to "get used" to the tune. Overall I am happy with the purchase. It's not like dropping a Hemi but 10+% increase for the price is not a bad tradoff. Haven't needed the tire size switch yet but it will be coming soon with the next set. Rated 4 out of 5 by JKSam from Good tuner, but had some issues after removing This will be a two part review: the first focusing on the tuner and the second on a major issue that I have with the product: Tuner: -Feature Rich -REALLY wakes up the JK -Easy to use (with one big caveat, see below) -Well built physical unit Issue: The Ignition software (which is integral to having the latest tune on your vehicle) is SEVERELY lacking. It's slow; it's clunky; it's not well done. The biggest issue I have is when it comes to uninstalling the tune from your vehicle. This process is poorly documented and there isn't a good test to ensure it is unlocked besides plugging it into another vehicle. I reverted the Jeep back to stock before it was sold and everything looked like it was fine and that my Superchips tuner would be unlocked for use with another JK. I give the tuner to my friend and the tuner was still VIN-locked to my JK that was sitting at the dealership already. \ I decided to just pay the $100 to unlock it, but the Ignition software is very poorly done. It wouldn't recognize the device on multiple machines or would error out when updating. Once I finally was able to get it updated, the only option that I was offered was to buy an extended warranty. I understand the reasoning for the VIN-lock, but the process for unlocking is not well defined or clearly done. Having the pay the $100 because of ambiguous unlocking guidelines/confirmations was annoying enough, but now I cannot even do that. That is frustrating and soured the experience. Rated 4 out of 5 by Ozone1965 from Big Difference I installed a throttle body spacer and cold air intake but only got a slight improvement in throttle response and some noise. It wasn’t until I uploaded the 91 octane program from flashpaq that I saw significant results. My only complaint is that it didn’t offer much other than the 91 octane setting. I was hoping it would also have the 98 octane setting and the extreme setting available (I think that’s what it was called) but it was worth the investment. My 2000 Jeep is faster than when I first purchased it. Rated 5 out of 5 by DAVIN from Great For Towing I bought this a few weeks ago after for my 2012 Jeep Wrangler in hopes of improving towing of my 17' travel trailer and improving shift performance. I've only tried the regular performance setting and 93 octane towing settings so far and I've noticed the biggest difference while towing - I have way more towing power! The regular performance setting has also improved the throttle responsive and brought back the power as I'm now running 33" tires. I love the option of being able to scan for codes especially when travelling and I'm unable to stop for a scan at the dealer. A lot of the other features are already available for changing through my Jeep but there are a few other neat features which I haven't yet felt the need to adjust. I have a 2008 JK 3.8L on that I installed performance 91 program and raised rev lim +500 rpm. If I chose to install the performance 93 program, would it be possible to raise the rev lim. over + 500? Is there a way to raise the rev. lim. +1000 on my JK3.8? Hi Anthony, I would have hoped that It was been possible to raise the rev limiter +1000 rpm when the performance 93 program was set on vehicle. Thank you for reply. I am not mechanically inclined by any means. I have a 2009 Jeep Rubicon with 111000 miles. I am running 17 or 18 inch rims. I know my speedometer is about 4 to 5 mph lower than actual. I have terrible fuel mileage. What do you recomend? For any of the 87 octane tunes, could I use a higher octane or does it have to be 87 octane? For example, the high mileage tune says to use 87 octane but I like using 89 octane. 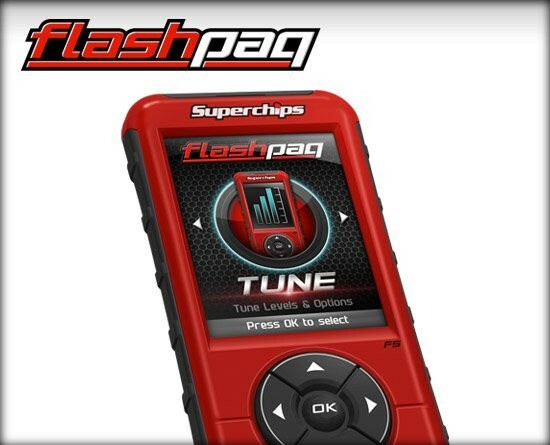 Would this affect the tune badly? What is difference between the 3782 vs 3784?